Successfully Added Versatile 4 Port USB 2.0 Squid Hub to your Shopping Cart. Versatile USB Hub to ensure easy access to an extra 4 USB ports on your computer. Some hubs make connection difficult due to close spacing or awkward sizes and shapes, with this hub freedom is yours! Fully compliant with USB 2.0 standards including 480mbps data transfer and complete backwards compatibility with USB 1.1. As additional feature each port has it's own individual over-current protection to ensure your expensive camera or phone will never be at risk from a wayward motherboard. 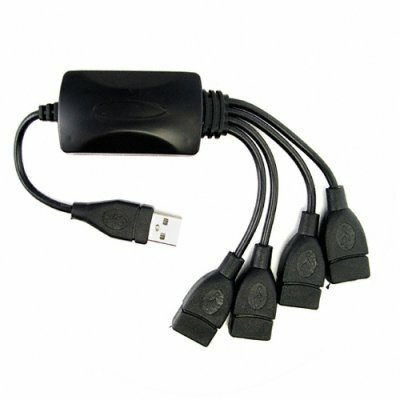 Upgrade your USB port now with an excellent wholesale price squid USB 2.0 hub from Chinavasion.